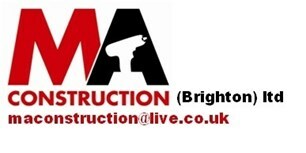 MA Construction Brighton Ltd - Builder, Plasterer based in Portslade, East Sussex. MA Construction is a small construction company based in Portslade with over twenty years experience in the trade. We are fully insured and employ qualified tradesman. We believe with many projects and happy customers under our belt, MA Construction (Brighton) Ltd provide a service hard to beat and a standard that we're proud to put our name to. MA Construction undertake a wide range of work including renovations, conversions, extensions, fire and flood damage works. We have built up an outstanding reputation over the last 6 years and all employees are easily recognisable wearing our logo work wear. All our staff undertake regular tool box talks and training. We offer competitive prices as well as free quotations which are valid for 3 months.